The technique of broadband dielectric spectroscopy is applied to materials used as electrode in lithium batteries. The goal is to understand the different phenomena of electron transport and thus to optimize the material and the battery. 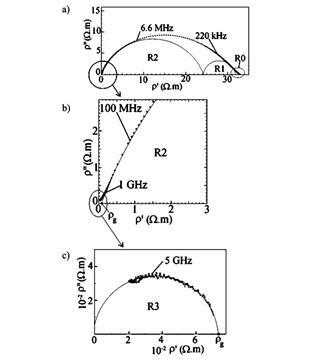 Properties (permittivity and conductivity) are measured from few Hz to several GHz. 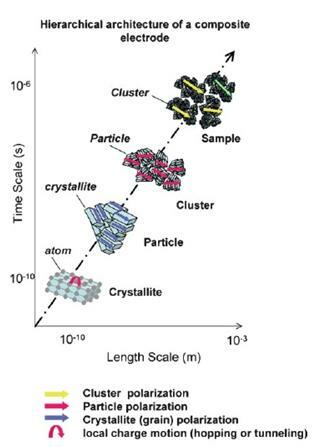 The results show that dielectric spectroscopy is very sensitive to different scales of the electrode (inter-atomic distances to macroscopic sizes) and to the morphology and distribution of the constituents. These studies are especially supported by the French research agency (ANR project; collaboration: B. Lestriez [project leader, IMN / University of Nantes], J.-C. Badot [LCMCP / Chimie ParisTech] et al). Figure 1. Hierarchical architecture of a composite electrode (from ). (c) high-frequency relaxation domain R3 (grain bulk contribution) upon subtracting the contribution R2. R0 corresponds to very small contribution of interface silver/sample, and ρg represents the (effective) resistivity of the grain (crystallite) bulk (from ). K. A. Seid, J.--C. Badot, O. Dubrunfaut, M.--T. Caldes, N. Stephant, D. Guyomard, B. Lestriez, "Multiscale electronic transport in LiNi_1/3 Co_1/3 Mn_1/3 O_2 : a broadband dielectric study from 40 Hz to 10 GHz", Physical Chemistry Chemical Physics 15, 19790--8 (2013). S. Berthumeyrie, J.-C. Badot, J.-P. Pereira-Ramos, O. Dubrunfaut, S. Bach, P. Vermaut, “Influence of the lithium insertion on the electronic transport in electroactive MoO3 nanobelts and classical powders: morphological and particle size effects”, J. Phys. Chem. C 114, 19803–14 (2010). J.-C. Badot, E. Ligneel, O. Dubrunfaut, D. Guyomard, B. Lestriez, “Multi-scale description of the electronic transport within the hierarchical architecture of a composite electrode for lithium battery” Advanced Functional Materials 19, pp. 2749-58 (2009).